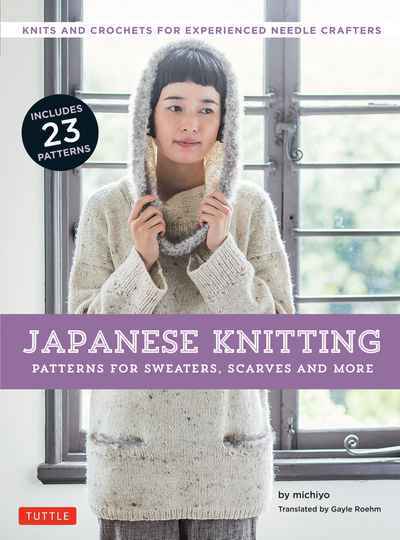 Create your own versatile wardrobe essentials with these chic new Japanese knitting patterns for apparel and accessories from cult favorite author michiyo. A whole new world of fashionable Tokyo-style knitwear designs opens to experienced needle crafters in Japanese Knitting: Patterns for Sweaters, Scarves and More. This is the first Japanese needlework book to be translated into English. The work of renowned Japanese knitting designer michiyo is often showcased on knitting and crochet websites across the globe. Her minimalist aesthetic and textural elements make her knitwear styles polished and flattering, whether worn layered or as stand-alone pieces. With this Japanese knitting pattern book, experienced knitters and needleworkers can create a diverse collection of effortless-looking pieces ranging from a pair of soft slippers to a structured jacket. An introduction by needlework instructor Gayle Roehm explains the Japanese techniques to readers who are trying them for the first time.